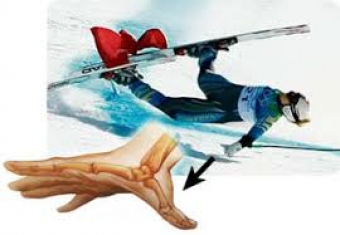 This is a very common injury to the thumb, in which the joint hyperextends during a ski fall onto an outstretched hand. This movement causes damage to the ulnar collateral ligament which may result in stretching, micro-tearing, or even a full tear of the ligament. If you experience a fall onto the hand on your way down the ski hill, and your palm is the contact point on the ground, this may result in initial swelling, heat, redness and pain into the inside of your thumb. You may also notice a lack in available movement, and difficulties with gripping, turning keys, and opening doors. Depending on the grade of the injury, there may also be bruising present. General laxity, meaning excessive amounts of movements to the thumb joint, can put ligaments at further risk of injury. A history of the same injury to your thumb also increases your risk of having it done again. Within the first 24-48 hours, prescribe Rest, Ice, Compression, and Elevation (RICE) to your thumb. Be sure the keep moving the other fingers and make slow gentle fists to encourage the other joints of the hands to stay mobile. After the first 48 hours, once the pain has resided a little, gentle range of motion exercises will help to optimize your healing, and protect the ligament in its process by strengthening the muscles around it. Before you hit the hills, use a brace if you’ve injured your thumb/wrist before, or if you are prone to falls. Taping can also be used.